I’m not usually a big fan of event tie-ins, but I’m always down for more Renew Your Vows. I love what Jody Houser has done with Annie Parker, so her being the focus of the team up makes this an instant buy for me. Thankfully, she makes it fully warranted. 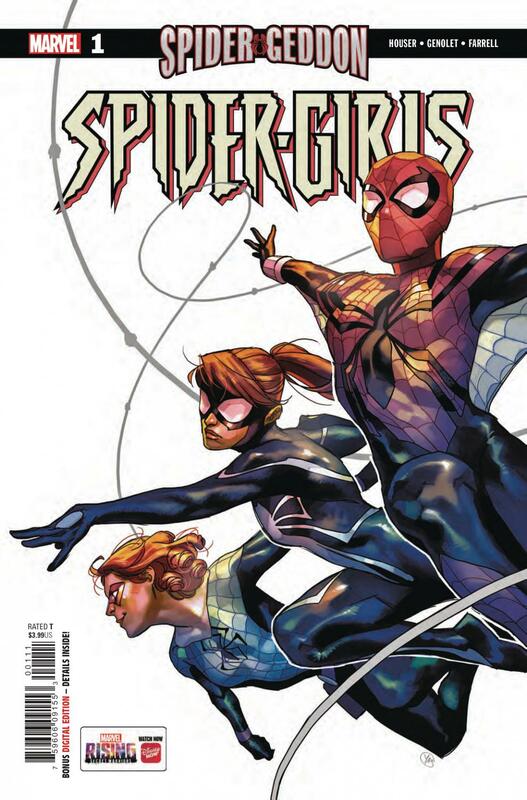 Spider-Girls #1 definitely reads more like an issue of Renew Your Vows than anything else. Those hoping for a lot of Mayday or Anya action may not be fully satisfied this time around, but I’d encourage to them to keep going. Fans of Houser’s RYV will, of course, be very pleased here, since this issue picks up old revelations from her run and keeps them going, giving us the most emotional moments. They also make this tie-in feel totally justified, something I can seriously appreciate. I’m glad Annie isn’t being asked to help just because she has spider powers. There’s never a dull moment and it sets up the adventure well, even giving new readers everything they need to know to get behind Annie wanting to step up to the plate. By far my favorite thing about Andres Genolet’s penciling is the faces. They’re so different from one another. It’s not, “oh, I can tell who’s who because this person has different hair,” but instead they’re all so clearly built uniquely. Emoting is simple but simply pleasant to the eye. It’s convincing. Acrobatics can be hard to follow, but otherwise everything checks out. I wish Triona Farrell would give the book some more color. There’s a lot of orange here and it… gives me a craving for orange soda. But the shading works really well and adds a lot to the tone of any given moment.